With High Contrast LED Meter!! 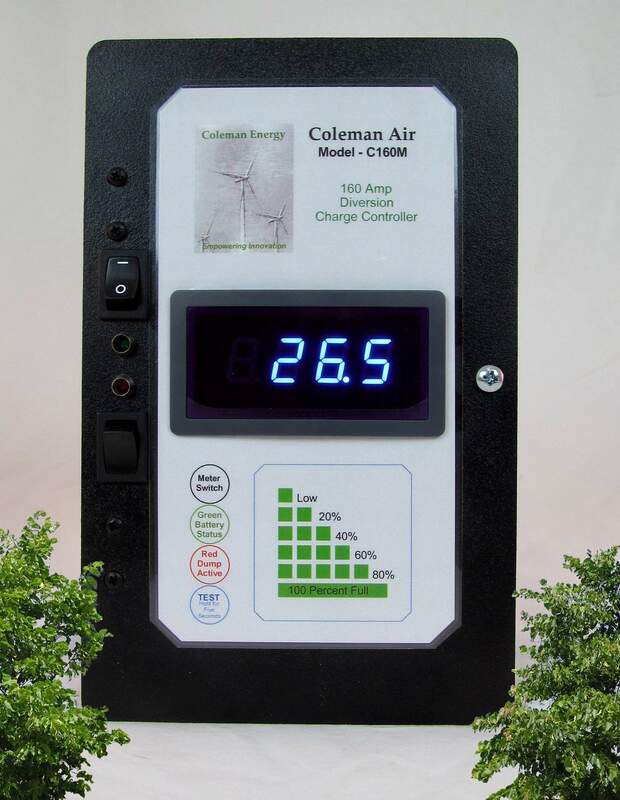 This diversion controller is the result of our many attempts to use the controllers currently on the market (offered by some of the largest names in the business), to work in conjunction with our wind turbines. None of the other diversion controllers on the market did what we needed a diversion controller to do. So we designed our own -- and added all of the features that are truly needed in a diversion controller. High amp rating - 160 amps, 3600 watts. 12 or 24 volts, no modification is necessary, simply change the jumper. 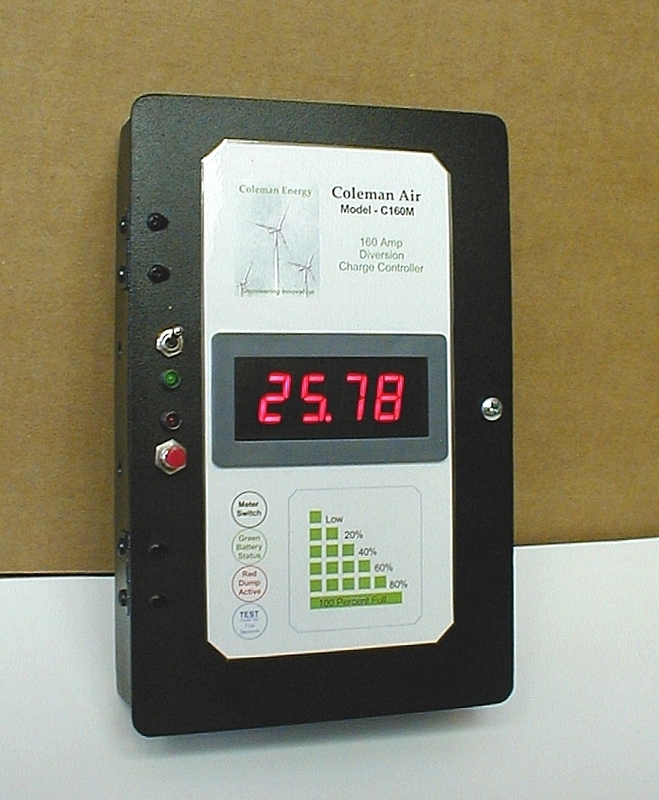 Battery Voltage Meter -- High contrast, super nice meter that has an on/off switch! Push to test. Ever wonder if your controller & load are working OK? Steel enclosure, with two conduit openings. Super large heat sink -- Pulling in multiple relays takes energy - which generates heat. This one handles it! Extended Diversion Mode can be enabled.. Settings are user changeable!! By simply turning a simple potentiometer with a small screwdriver, you can quickly adjust the trip point. The enclosure is heavy gauge, solid steel, ready to mount. -- No plastic, no junk, simple and rugged, built specifically for this purpose in our CNC machine shop. High contrast super clear, LED volt meter with on off switch. 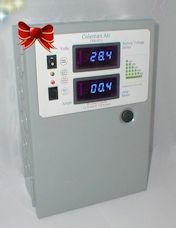 Finally, by popular demand, we have added a high quality LED voltage (battery) meter to our most popular controller. This meter is a super high quality meter with auto-contrast brightness. (It gets brighter as the ambient light is increased.) The meter draws only .0013 amps, so it's a real miser, yet because we know how no one wants to waste that hard earned energy, we have put a on/off switch on the front panel, so the meter can be shut off when you do not need it! The picture simply does not do justice to the clarity of the LED meter, the camera just can't focus this close. 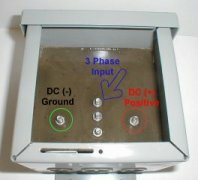 The basic operating philosophy of a diversion controller is quite simple. 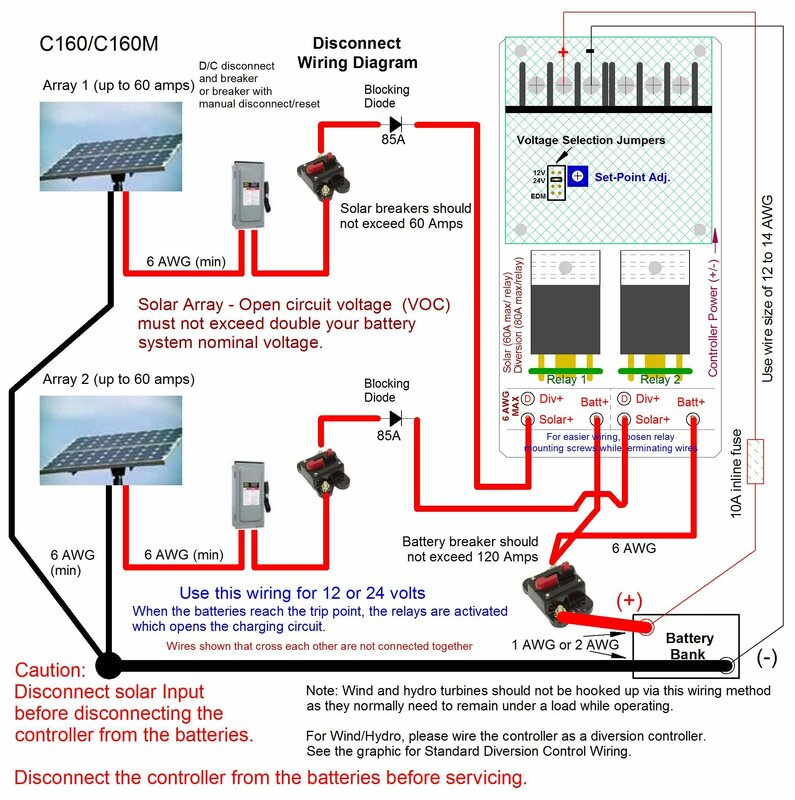 Monitor the battery voltage, and if it should rise to a predetermined level, connect a diversion load (or "Dummy Load"), of sufficient size, to the battery or energy source to prevent the battery voltage from increasing any further. This is a very simple, yet very effective way of preventing battery overcharging. All alternate energy systems should have some form of battery overcharge protection. 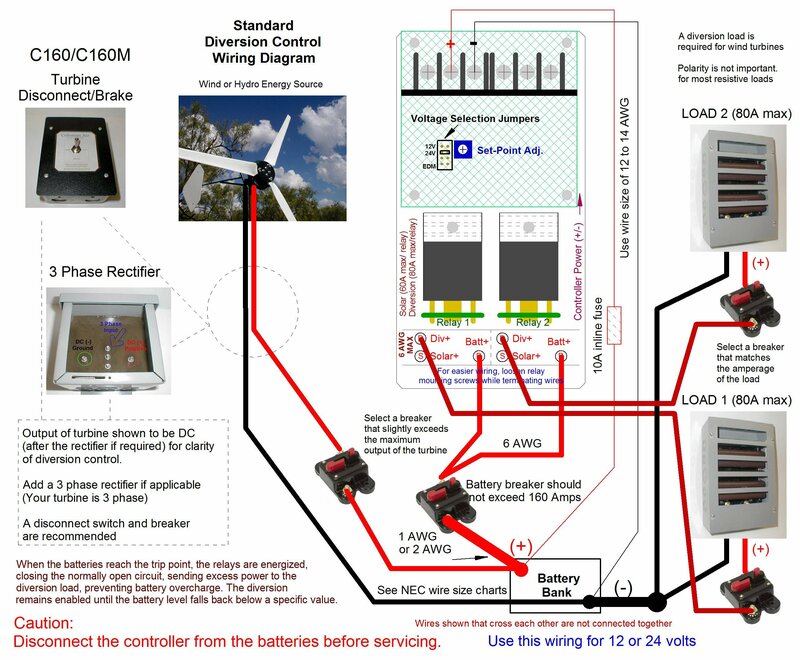 We happen to believe that is far better to leave the wind turbine connected to the batteries at all times. Why? 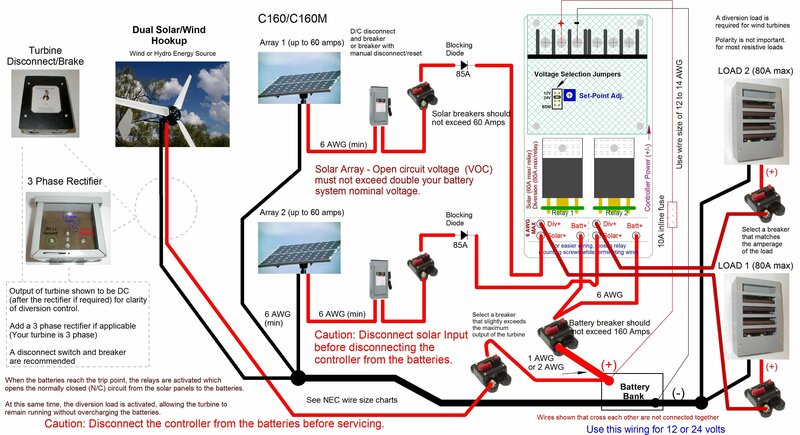 When you remove the battery level voltage from a wind turbine and send it's power directly to a load, then it sees for all practical purposes a short circuit (depending on the resistance of the load and lead wires.) This may cause the turbine blades to slow dramatically and in some cases bring it to a halt. This braking action can cause heat build up in the stator if it is repeated every few seconds or so (if the battery is just a little over the top). When you allow the turbine to see the batteries, along with the load, the turbine remains more within it's design realm -- always a good thing. 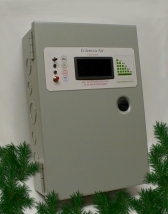 The internal relays are configured to dump the batteries along with the source, but if you desire to disconnect the source from the batteries and send it to the load directly, simply utilize the N/C contacts of the relays as well. We'll be happy to send you a diagram -- this is a very simple change. 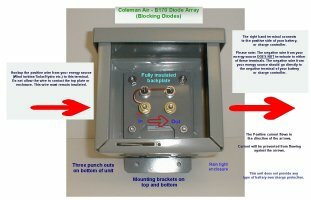 Do they have a high quality voltage meter with on/off switch? Can they truly pull in multiple relays without burning up or do they need fans? Click here to download the Diversion Controller Manual.